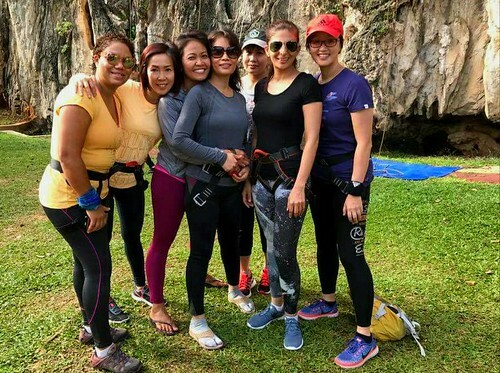 Last Sunday, the Jungle Babes went rock climbing. For some of the group, it was their very first time climbing. For me, it was my first time back at Gua Damai in over 10 years. It’s funny how the memories of a place can make you feel. As I pulled up my car into the parking lot, I couldn’t help but notice how much had changed even though I’d seen the updated pictures before. It’s one thing to see photos but quite a different thing altogether to see the place in the flesh. For a while, I couldn’t move. All I could do was sit in my car staring up at the wall, feeling the butterflies in my stomach. It was like running into an old crush you never quite got over. When I finally made it to the base of the wall, all I wanted to do was look up at the routes – my old friends – to see if I could still recognise them. 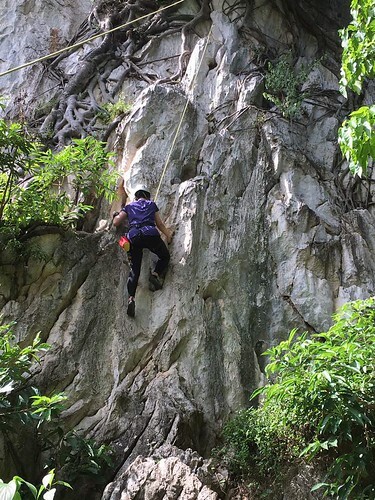 I have climbed every route at Damai – minus the new ones that were added after I stopped climbing. Some, I remember better than others because I climbed them so many times that I can still see the handholds when I close my eyes. I could still recognise “The Good Onion” – my very first multi-pitch; “Jah Lap Climbing” and “Water on the Rocks” – the routes on the far left that we used to think were too hard to climb; and who could forget “Monsoon“, my first project route? There were a few jibes about my age – something about our belayers being little kids when I last climbed at Damai. Well, I did say I’d like to still be rock climbing when I turn 60. It’s nice to know that there is hope yet for that alternate reality. As I tied in before climbing my second route, I heard a couple of climbers talking about working “Monsoon”. Looks like it was still THE route to project at Damai and it was reassuring to know that some things didn’t change. I was a little disappointed that the top-rope for Monsoon was not up. It would have been interesting to see if I still had it in me to climb it. The Jungle Babes were awesome – each and every one of them was amazing. We’re talking ladies who had never rock climbed before – ever. Not even in a rock climbing gym. And, yes, if you must make fun of our ages, I will flaunt the age card. Beat that! “Back in my day”, photos and videos could only be taken on someone’s digital camera because mobile phones did not take photos. Yes, I climbed that long ago… Back then, memory stick sizes were limited so we took mostly photos and not too many videos. In fact, I can’t believe that in all my time rock climbing, I only had one video recorded of me rock climbing! The Babes, however, made up for that oversight by recording two videos for me climbing – thank you darlings! When people tell me they don’t climb because they are afraid of heights, I am reminded of the reason why I chose to climb – because I was afraid of heights. Is it the fear that brings clarity? Because that’s when the lessons from the wall are clearest. When you’re rock climbing outdoors, there are certain sections of the wall that afford you a place to rest and recover. It might be a ledge, or a knee-bar, or a couple of jugs that offer some respite from the arduous climb. The opportunity to take that break is often necessary and good for us so that you can prepare for the challenges that lies ahead. Unfortunately, it also means that you might get so comfortable that you struggle to move on after you’ve recovered. That’s exactly how it is in life. Inevitably, we arrive at a place that feels so solid and comfortable that it’s hard to get moving again when the time comes. To leave that security towards uncertainty – to go from a jug and a ledge to crimps and tiny footholds – is hard. 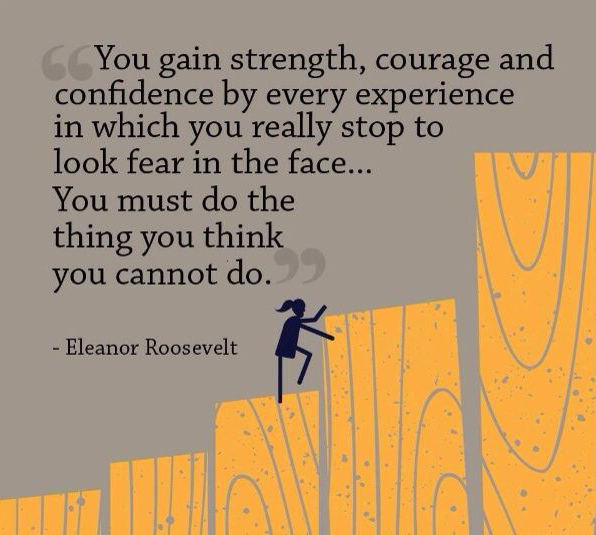 We have to fight the instinct that tells us not to rock the boat so we can start taking risks again. The only way to grow and become better is to take risks and for that we need to break away from the feeling of security.